Some people jam music, here people jam art. Simply walk in and let your imagination take hold of the paint brushes. We are more than paint & canvas... We pump creativity, imagination, & colour to a chillout beat. No drawing or painting skills are needed. Artjammers at the studio are provided with canvases, acrylic paints on tap, and tools to freely express themselves. Let your mind loose and fill the canvas with colours and inspiration. 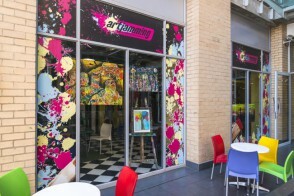 Artjamming is paintertainment for all ages, whether it's with friends, family, co-workers & clients, or young children. We also offer birthday parties, team-building events, corporate events, school holiday programmes, art lessons, workshops, and more.